Today was a ski day. I had been planning all week to ski at Gore Mountain today. I knew that perhaps it would be busy, being part of the vacation week, but I wanted to get on the slopes. I was at there, booted up, when the lifts started. 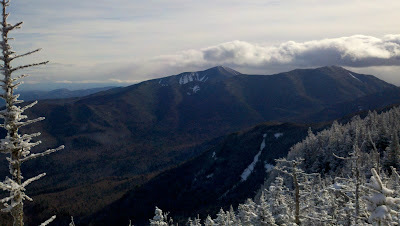 I was able to get in 3 runs before the lift lines started to grow. Visibility was poor and flurries were coming down. The snow guns were going on quite a few trails. The snow was a little sticky in spots and icy patches weren't hard to find. Still it was great to be out. The temperature was right around freezing and there was no wind. 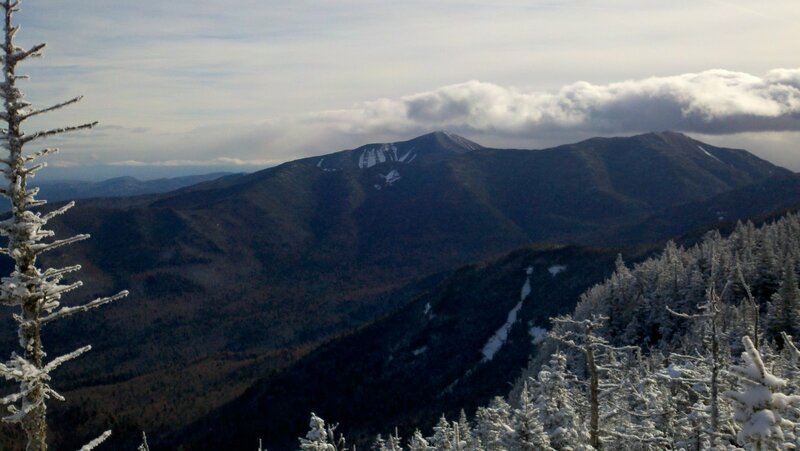 I ran into a buddy from work and we skied together until noon. I didn't take any pictures due to the poor visibility, but I managed to ski 13,000 vertical feet by noon. 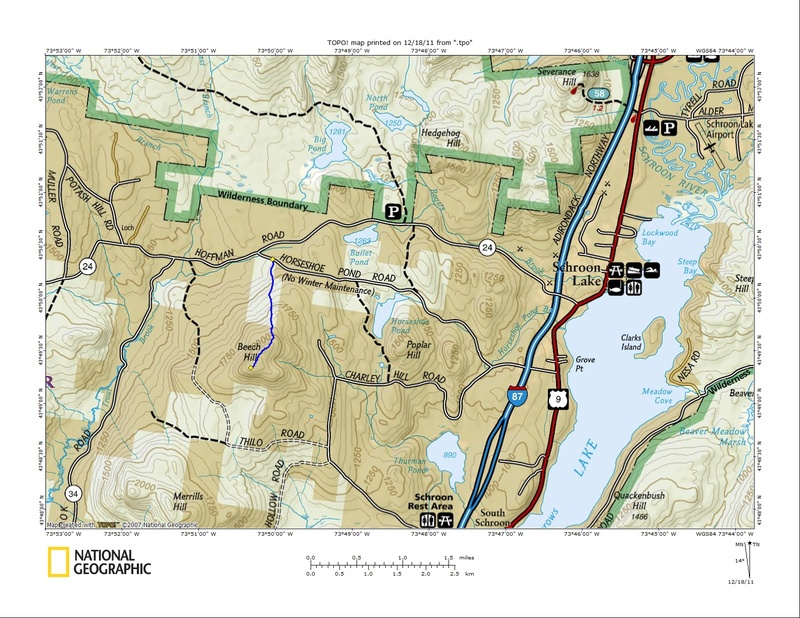 I parked at the Second Pond trail head in the Siamese Ponds Wilderness and followed the trail for a mile, at which point I veered left to bushwhack up the mountain. 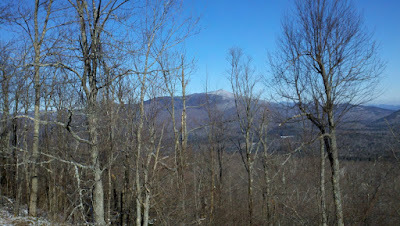 This mountain has 2 summits on the ridge, so I walked the ridge to see both. As I neared the first summit, I began to see moose tracks and scrapings. Just before the summit, I found many moose beds from the day before. The actual summit was so thick with spruce growth, I could hardly get there. As I approached the 2nd summit, I came across a fresh moose bed. Apparently I had scared him out. His hoof tracks were as big as my hand. 2nd summit...and a moose nearby! It was now 3 PM, and my cell phone was just on the verge of dying. 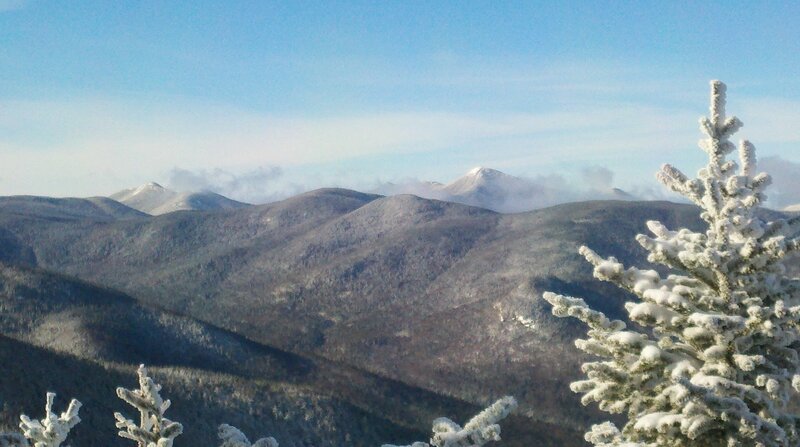 I was on the 2nd summit taking a last look at my phone when I heard the moose! He had to be 100 feet away, but I couldn't see him. I could feel the ground shake as he ran off and I could hear his antlers hitting on tree branches. He must have been standing nearby in the thick growth, and when I stopped walking he took off. 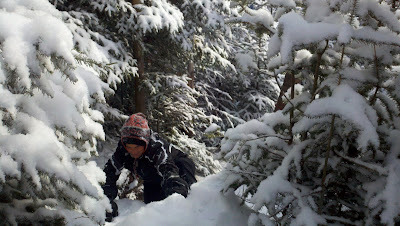 Unfortunately I had no time to follow him since I had to bushwhack back to the trail to get out off the woods by dark. I was back at the car at 4:05 wishing I was still on the track of the moose. I really wanted to get a look at him and get a photo. Maybe next time. Quite a day all in all. 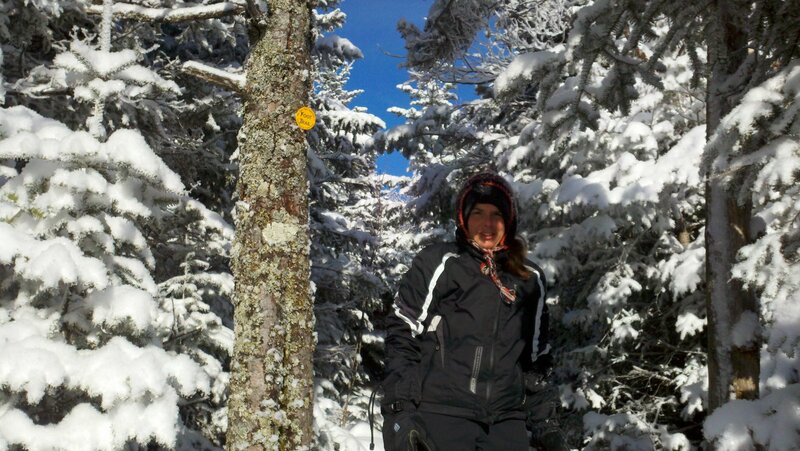 Nice combo of skiing and hiking. Now home to plan for the weekend! Leesa and I were ready to tackle a couple more 4000 footers in the Adirondacks, Street Mountain and Nye Mountain. 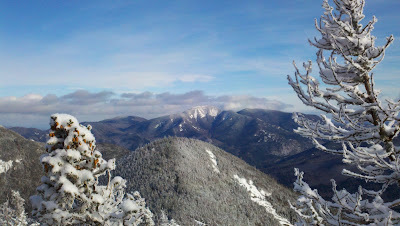 Although Nye Mountain is not an official 4000 footer (3895'), it remains on the ADK 46er list. 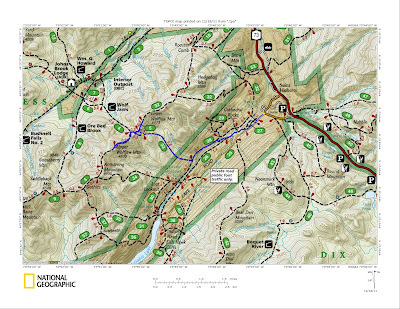 We had researched the hike and were prepared for a 6-8 hour hike. We parked at Adirondack Loj at 8:30 and were on the trail within a couple minutes. 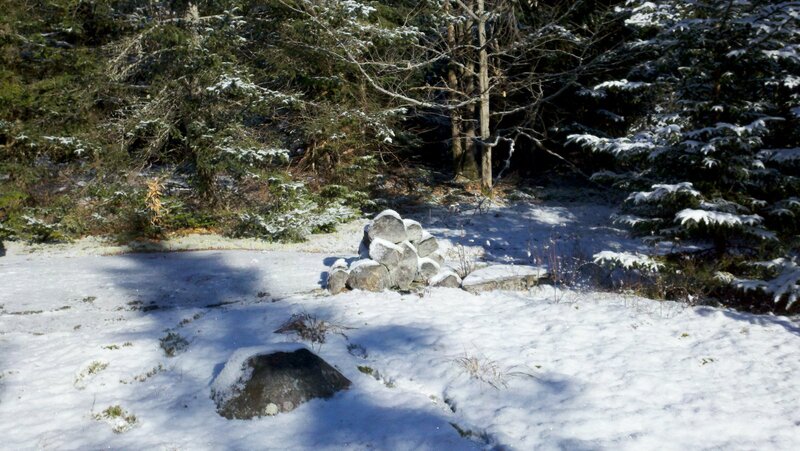 There was only an inch or two of snow on the ground. While the mountains are trail less, a fairly well used herd path exists. We followed a trail west along the north shore of Heart Lake until we came to a fork where the Long Trail proceeds to the right towards Mount Jo and the fork to the left had a sign that said "Trail not maintained beyond this point". 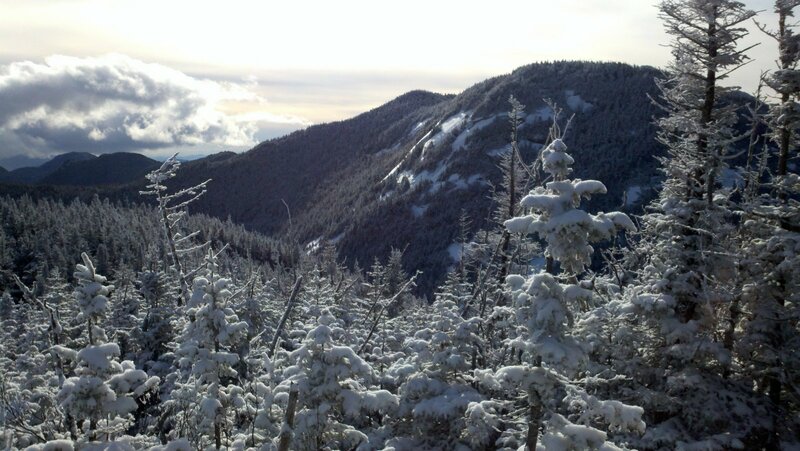 This was the old Nye ski trail. No one had been on the trail yet, but foot tracks were visible under the recent dusting of snow. 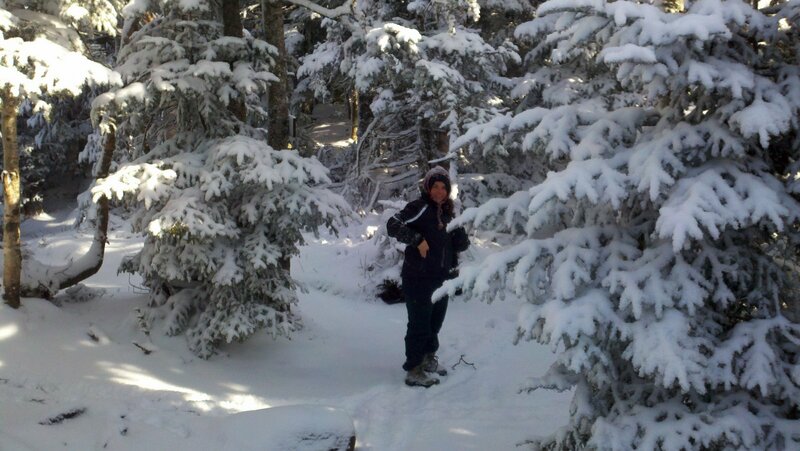 We took the fork to the left, and after a mile or so we came to Indian Pass Brook. We had been forewarned that the crossing was difficult at best. 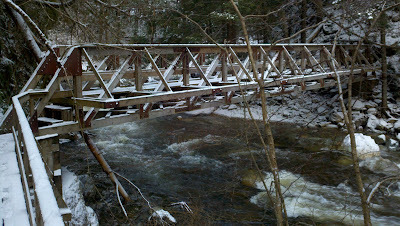 Several hiking parties had recently signed the trail register saying that they could not cross the brook. Another recent comment said to go upstream 500 feet or so from the usual crossing and that a crossing was possible. We looked over the area and also decided it did not look safe to cross. We started back towards Adirondack Loj contemplating our next move when we came across another hiker planning to do Street and Nye. We retraced our footsteps with him and the three of us surveyed the brook. While the gentleman and I found the proposed crossing and were discussing the possibility of fording the brook, another hiker arrived who was a guide. 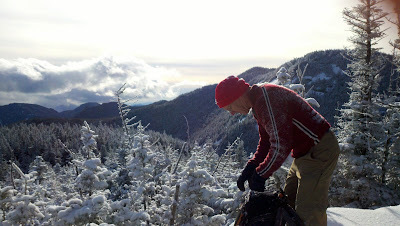 He was scouting the crossing for a proposed guided hike on Wednesday 12/28. While he and Leesa looked at the traditional crossing spot, the hiker who was with me managed to cross the brook at the alternate location. 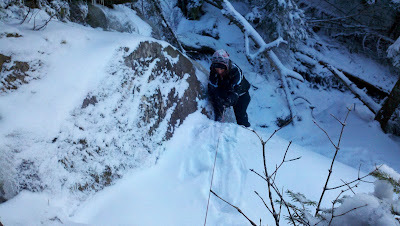 There were several decent size rock hops involved onto ice/rock areas where you couldn't be certain you would land safety. After he crossed the brook, he went downstream to try and relocate the herd path. The guide and Leesa came back to where I was and reported that the traditional crossing spot was indeed too dangerous. The three of us were looking at the alternate crossing when the first hiker came back into view saying he couldn't find the herd path. He started to come back across and the ice broke. He fell back onto a rock and luckily didn't get wet, but that was enough to decide our fate for the rest of us. 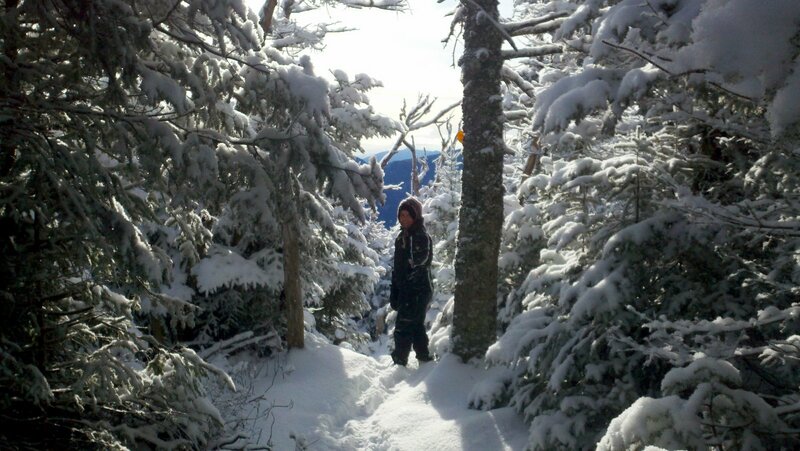 We waited for the first hiker to get safely back across and then the four of us headed back towards the lodge. It was 10:45 at this point. Leesa and I decided to salvage the day by going up Mount Jo. The first hiker decided to join us, while the guide went back to the trail head. In all the times I've been to Adirondac Loj, I had never climbed Mount Jo. I just considered it too small and I had bigger hikes planned. I'm glad we chose to do it. The summit elevation is only 2851', but the views are spectacular. The ascent was only a half mile or so but steep with 700' vertical gain. The three of us got to the summit and were admiring the views for quite a while before 2 other groups reached the summit. At that point, Leesa began to feel a little chilled so we descended to the Loj on the Short Trail. One of the reasons we had originally chosen Street and Nye for the day was that it was supposed to be quite windy and blustery and we thought that Street and Nye being treed summits would provide us protection from the wind. As we climbed Mount Jo, there was no wind and there was a beautiful blue sky. 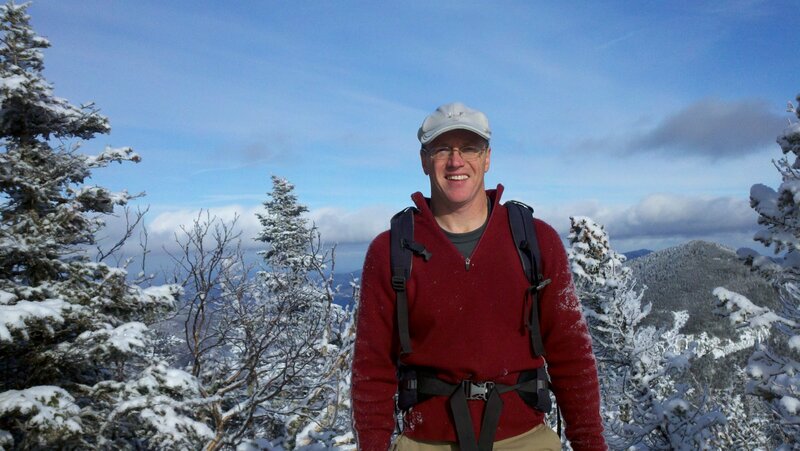 Standing on the summit we looked at the great views of Street and Nye, Wallface Mountain/Indian Pass, Avalanche Pass, Mount Colden and Mount Marcy. 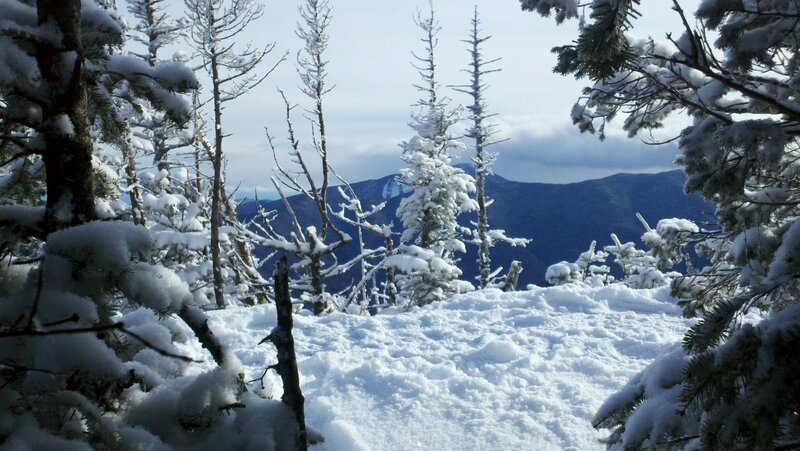 You could also stand on a different portion of the summit and see Lake Placid. After we had been on the summit for awhile, some interesting cloud formations began rolling through Avalanche Pass and Mount Colden. The view was changing minute by minute and we just watched. It was quite a site. We returned to the car just after 1 PM not feeling horribly disappointed. We'll tackle Street and Nye another day. Leesa and I celebrated Christmas on 12/24 with my parents and my kids. 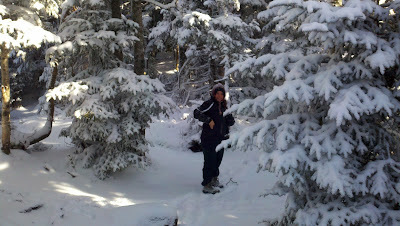 After having a great meal and a week of holiday eating, we headed back to the woods for some exercise on Christmas day. 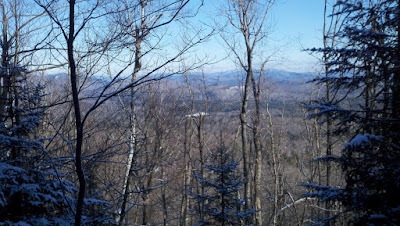 We slept in a little after the holiday celebration, but we wanted a good solid half day hike. 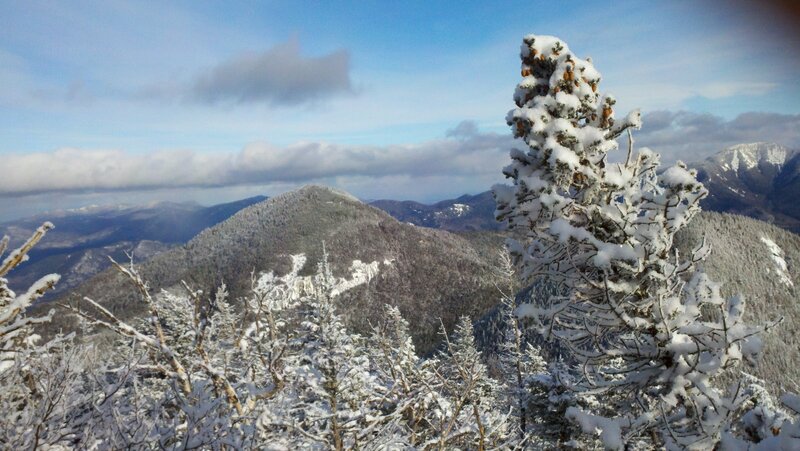 Jay Mountain is located just east of the town of Upper Jay, which is just east of Whiteface Mountain ski area and Lake Placid. While Jay does not have a marked trail, there is a herd path that is well defined to the summit ridge. Once on the summit ridge, there are small rock cairns all the way to the summit. We parked at the trailhead (a pipe with yellow spray paint) at 9:40. The herd path heads pretty much in a straight line east for 1.6 miles to the beginning of the summit ridge at 3200 feet. The ridge continues for approximately 1.2 miles to the summit where there is a large rock cairn. 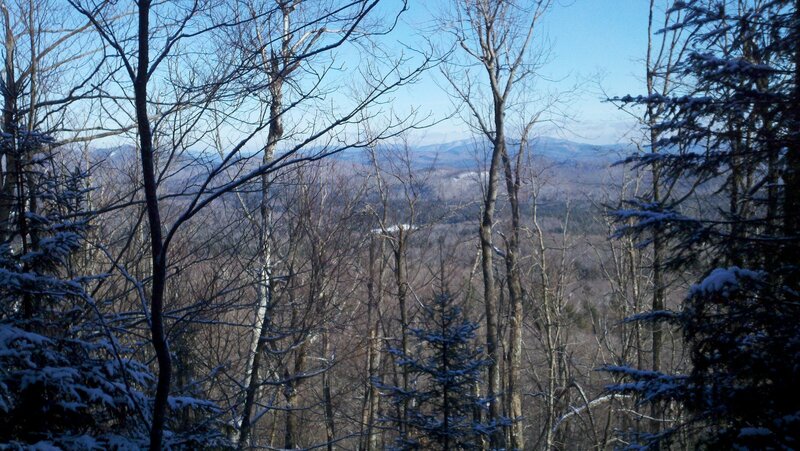 There are great views along most of the ridge. On this particular day, the temp. was in the upper 20's, but the wind was quite strong most of the day. The sky was overcast and there were flurries all day, but there was enough visibility to see all the nearby peaks. There was only an inch of snow at the trail head and 2" at the summit. Areas exposed to wind were bare rock. We found micro spikes to be helpful on parts of the trail. Not many Adirondack ridges, especially at this elevation, have an exposed ridge line comparable to the Jay Mountain ridge. It is a hike not to be missed. It's a great half day hike. 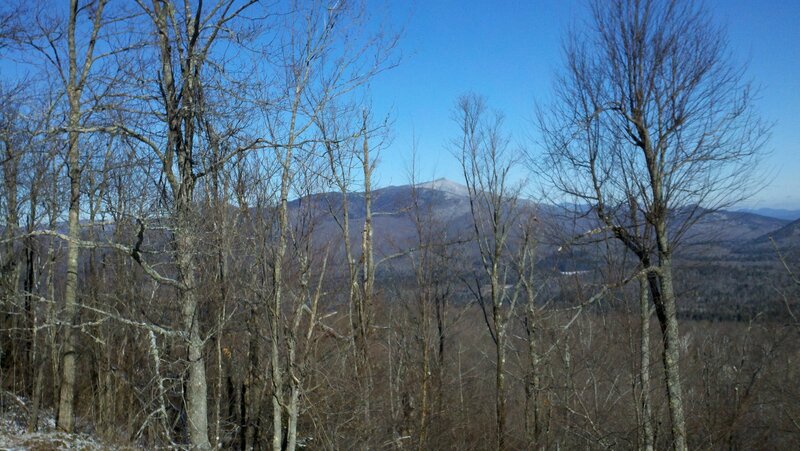 We'll be back in warm weather to linger on the ridge. 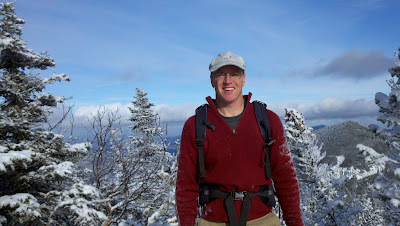 Yesterday we climbed 2 Adirondack high peaks (Upper and Lower Wolfjaw), so today we went for a shorter hike. 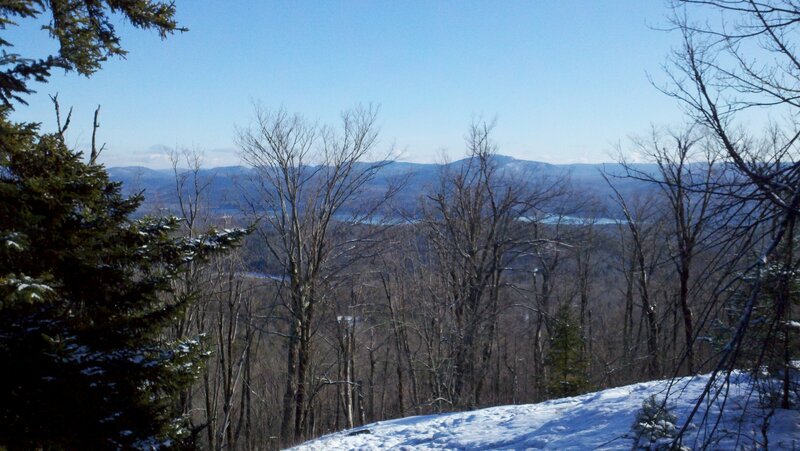 This trip was to Beech Hill in Schroon Lake. 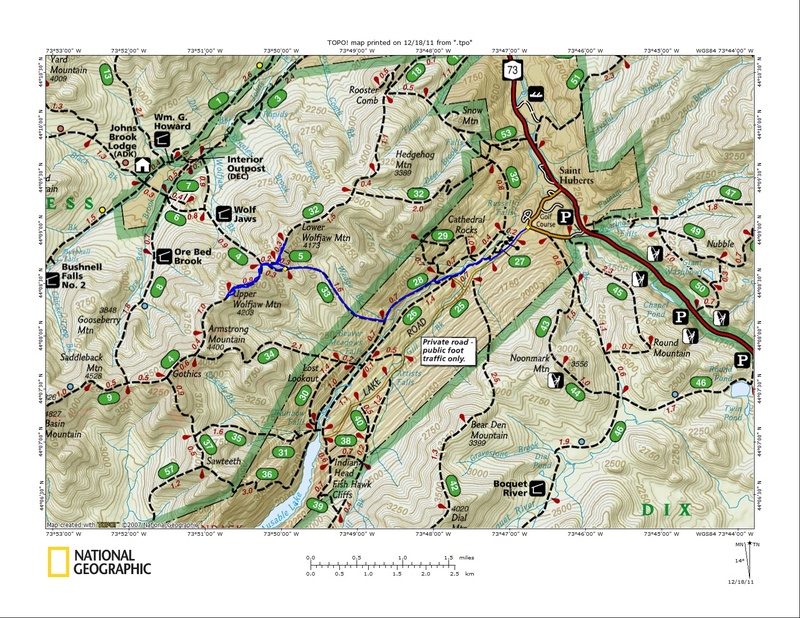 The summit elevation is 2178'. 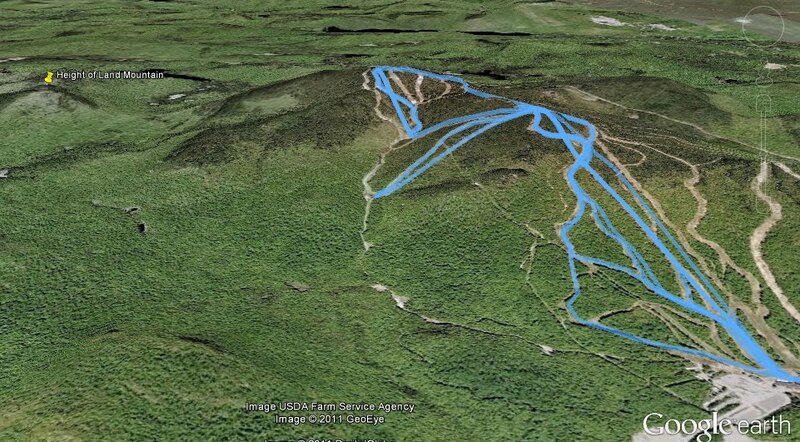 The mountain is near our camp and we just had a nice little bushwack/GPS navigate to the summit. 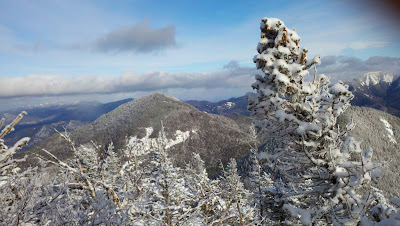 The true summit doesn't have much of a view, but from the lower portion of the summit ridge you can see east and north. 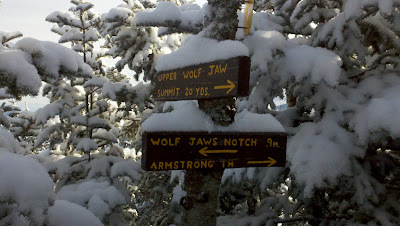 Saturday proved to be a great day to climb a couple more high peaks, Upper and Lower Wolfjaw. I had climbed them many years ago with my dad, but Leesa had never climbed them. 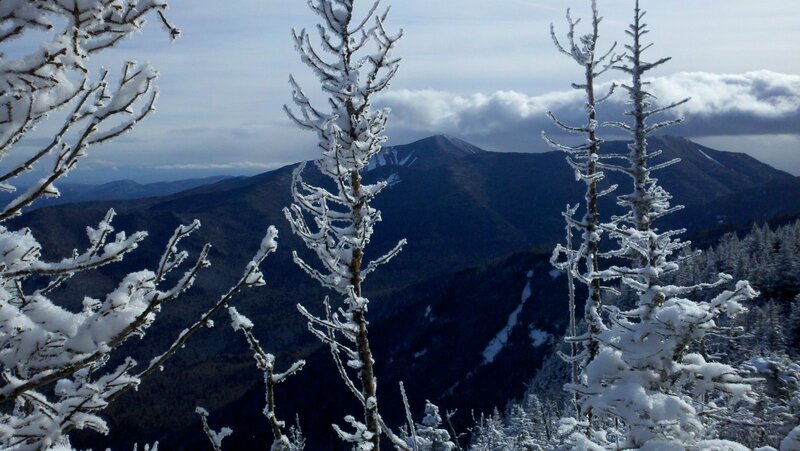 As far as Adirondack High Peaks go, they rank numbers 29 and 30 respectively at 4185' and 4175'. We parked at the designated parking area near the Ausable Club in Saint Huberts. We left the trailhead at 7:45 AM. There were already about 8 cars in the parking lot, but nobody was on the trails we took. We broke trail all day long. 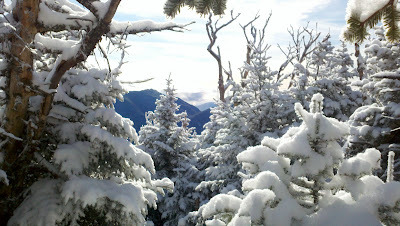 There was a fresh 1/2 inch of snow at the trailhead, and about 6 inches of snow at the summits. 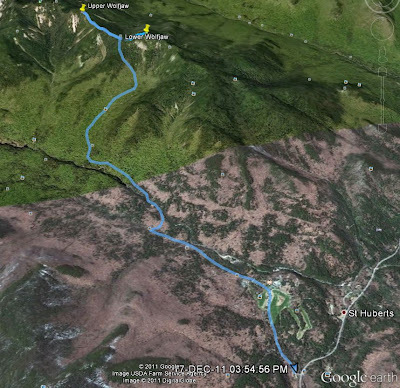 The route we took was the Ausable Club Road to the West River Trail to the Wedge Brook Trail. 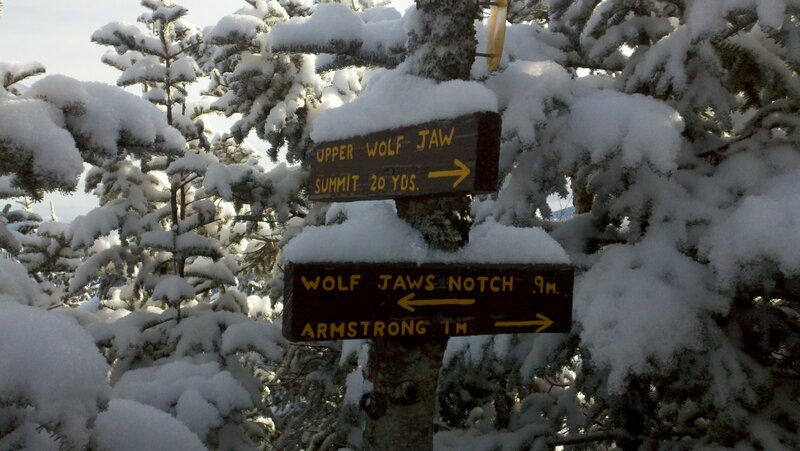 That brought us to the col between Upper & Lower Wolfjaw. From there we ascended Lower Wolfjaw and returned to the col by 11:45. We hadn't planned on ascending Upper Wolfjaw, but it was early enough, and we were still feeling good, so we ascended Upper Wolfjaw and returned to the col at 1:30. We descended the same way we went up and were back at the car at 3:45. At about 2:30 we saw 4 younger guys heading up. They were going to set up camp at a designated camp site, located at about 2700' in the bowl just before the climb to the col. The were going the spend the night, then head for Gothics the next day. We hope they were warm enough, since it got to about zero degrees Saturday night.